The larvae which are not usually attended by ants feed on a variety of plant including Buckinghamia celsissima, Cupaniopsis anacardioides, and Harpullia pendula. Mature larvae pale orange-yellow with black spots on the anterior segments, dark hairs present; head shiny brown. 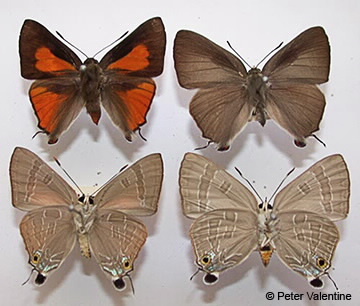 Adult male fore wing is black with an orange central area, hind is orange red with black veins; female is grey, both sexes have a lobe and tail on hind wings; lower surface pale brown with darker bands, hind with iridescent blue-green to black spot ringed with orange, lobe is black.